I heard a report on NPR this morning about the decommissioning of the Shuttles remaining in the Space Program and the movement towards the new Orion rockets (based, if I remember correctly, on the early Saturn rocket design). While I have no objections to the design they’re moving towards (staged separation rockets, as far as I know, have a lot less of the maintenance issues that plagued the Shuttle over the last few years — and as a result cause far fewer teachers to incinerate), I do have some objections to the trajectory of the program. The main goal, it seems, is to get back to the Moon. We’ve only had a little over 300 hours to explore the Moon. There’s so much left of the planet to explore. We need to get smart minds excited about space again. So what? My parents generation has been to Vietnam. Doesn’t make me want to fight another war there. Seems like a pretty juvenile argument, to tell you the truth. First of all, the Moon isn’t a planet. It’s a moon. Show some respect to poor Pluto. Second of all, in the time we’ve spent there, we’ve figured out that a) the moon is not easily or readily inhabitable and b) the moon used to be part of the Earth c) it’s now a big ball of dust and rock with little signs of life, water, etc. What else do we need to know about it? There are tons of exciting challenges in space. Tons. Not the least of which would be cleaning up all of the junk we have in orbit which caused the ISS people to be on high alert last week. I don’t see how going to the moon is particularly exciting and inspiring to a new generation. It’s done (unless of course you believe the conspiracy theories, in which case we haven’t actually done it yet). Let’s aim higher. There are those who agree with this and think that, if we want to head to the Moon again it should only be to the purpose of establishing it as a base of operations for deeper space exploration (Mars for example). The Russians seem to have the right idea. On Tuesday they will start experiments with the aim of testing how humans would react to such a long space flight as the one required to get to Mars. Only time will tell how this all will come out in the wash. But I definitely think we should think carefully about our long-term goals in terms of space travel. Especially considering it’s a recession and these things are damned pricey. Slagsmålsklubben – Sponsored by destiny from Tomas Nilsson on Vimeo. Oh Ikea! You’re so weird! 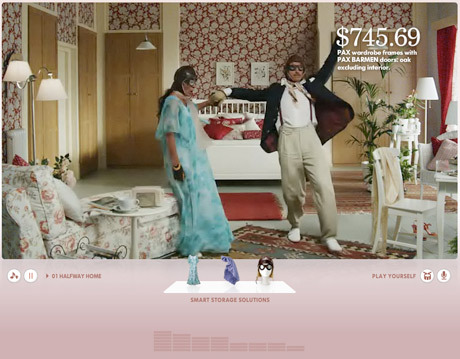 It’s a strange interactive Ikea ad where music makes the actors/dancers move around (mostly backwards as far as I can tell). It lets you choose from a couple of pre-selected tracks and use your keyboard for some midi-style canned drum samples. The most fun thing I’ve found with it is to upload something from your music library and have them dance to it. They seem to especially like TV on the Radio. Just saw this on Vulture — It’s pretty lo-fi and he basically looks like a kid in his parents’ basement. Now of course, this makes sense. Google owns AdSense, the ad-trafficking network on all of these pages. And they certainly have a right to send their own ads wherever they’d like. Doesn’t this verge a little bit on an anti-trust issue? 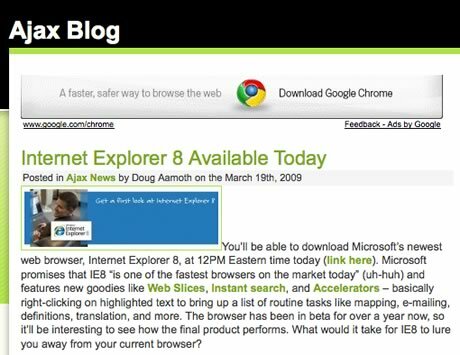 Google can control the flow of ads to pages that mention the text ‘IE8’ — so that they basically own all ad space next to talk of Microsoft’s product. Within their network, of course. But since they bought DoubleClick, their network is huge. And while they might not be able to put their ads on commercially sold properties (AOL, NYT, etc), I’m sure they’ll send some of their bulk AdSense ads to those pages. And I’ll bet that if there’s a mention of IE8, there’ll be an ad for Chrome in that AdSense spot. I’m sure it’s nothing. Google only recently started advertising for their own products, so I’m sure they’re testing the waters a bit. And there’s no way the Justice Department will ever figure something like this out until years after the fact. But it does show a huge potential for abuse of power in Google’s ad network, no? There’s been a lot in the news lately about the Jon Stewart/Jim Cramer interview on the Daily Show. I just watched the full interview, and I honestly don’t know how to feel about it. It’s pretty clear that Jon Stewart was trying to make a case that CNBC could have worked harder to defend its audience from the financial sector. And Jim Cramer basically said ‘Yes! But you see, I run an entertainment program too!’ back to Stewart. I honestly feel like the interview was editited to make it more salacious than it actually was. What it was was two men at an impasse. And I honestly feel like neither of them came off looking much worse than when they came in. Watch the Full Interview at Comedy Central and decide for yourself. You are currently browsing the Geek Chic blog archives for March, 2009.